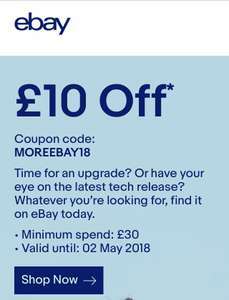 Just received an email from eBay, looks like they’re offering a similar offer to other recent ones. £10 off £30 spend, expires 02/05. Looks account specific, so check your emails! No go for me, must be account(s) specific. @OP don't forget TCB 1%. Maybe an account specific as it didn't work for me. Apologise, just tested, you are correct. Thanks, updated the code. Just re-reading the email I believe it is account specific, sorry guys! Tried both codes - Neither worked it's probably only for you, OP. Got one this morning,think account specific maybe? Sad that the Hotukdeals hit squad are now deleting comments criticising these deals. Strange. Yet very illuminating. Jobsworths. Looks like that' s the wrong code. Please double check and try again. Sad that the Hotukdeals hit squad are now deleting comments criticising …Sad that the Hotukdeals hit squad are now deleting comments criticising these deals. Strange. Yet very illuminating. Jobsworths. Yeah they deleted messages from when I criticised about a generic PSN sale, not one item was given as an example. I used an abbreviation which I won't put here, and they told me it was removed due to inappropriate content. I see swearing on here all the time and yet nothing is done about it. I think there are certain mods who get a thrill from the power trip. "Looks like that's the wrong code. Please double-check and try again." Shame.